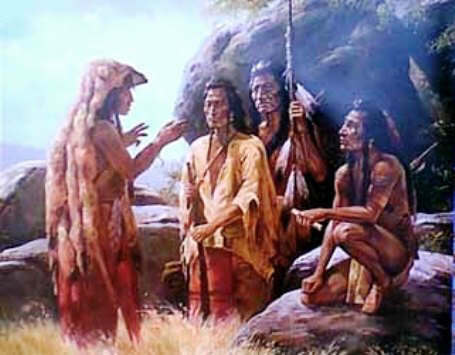 I From 1754 to 1763 there was a bitter war carried on between the French, aided by the Indians, on one side, and the English, aided by her colonies, on the other. We shall pass very quickly over this war, which, though very important, does not chance to have so very many stories for young people in it. One of the first attacks in this war was made on the French settlement in Acadia. I wish you were old enough to read the beautiful story of Evangeline as it is told by our Longfellow. By and by I hope you will read it, and will learn to love this beautiful Evangeline, who was so cruelly driven from her home in Acadia. In the beautiful Basin of the Minas was a quiet little French village. The people of this village were peaceful, home loving families, and took no part in the war on either side. The English colonists, however, fearing that they might, by and by, be persuaded to join the French forces, made up their minds to break up this village and scatter the people. One bright morning the English officers came into the village and demanded that the people be gathered in the churches to hear a message which the English brought to them. The people all left their work and flocked to the churches. The farmer left his harvest field, the blacksmith his anvil, the wife and maiden their spinning-wheels. No sooner were all the people within the churches than they were surrounded by British soldiers, hustled down to the water-side, and crowded on board the ships like so many herds of sheep. O, it was a cruel deed! Families were torn apart; wives lost their husbands; mothers lost their little ones; brothers and sisters, lovers and maidens, were doomed never to meet each other again. Piteous were the cries of these poor people, but the soldiers only laughed at their grief. As they sailed out from the harbor, they saw the soft September sky all one terrible glare of flame. Then they knew that their last hope was gone; their beautiful homes were burned. This the cruel soldiers had done lest the poor Acadians might try to wander back to their old home in this beautiful Basin of the Minas. When these vessels reached the New England coast, the unhappy people were put ashore here and there at different places, from New England to Virginia, that there might be no possibility of their banding together again. Very few of them ever met their dear ones again, and many died of homesickness and heart-break. This Story of the French and Indian War is featured in the book entitled American History Stories, Vol. I. (Revised Edition), by Mara L. Pratt, Boston: Educational Publishing Company, 1908.